A city is defined by its artists. We are first drawn to the city for the design of its unmistakable landmarks and the decorated shop windows. We then leave our cities to visit other far away ones with their own distinct architecture and novel marketplaces which allow us to break out of our daily routines and become reunited with the world at large. 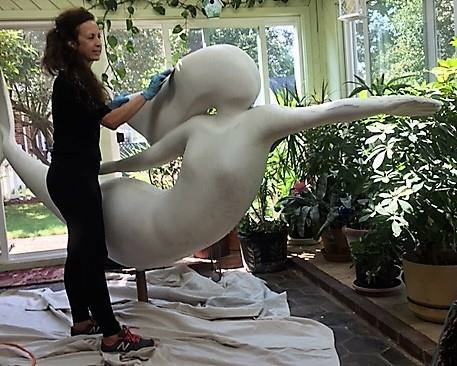 The Norfolk Sister City Association (NSCA) has found a way to use art to define its local community and to connect with communities abroad. Recently, NSCA sent a custom-made mermaid sculpture to her Sister City of Kochi in Kerala, India. Sister City programs have always played a significant part in sharing their cities’ culture with the world in a way which serves to further preserve and honor the local identity, but highlights connections between communities around the world. The mermaid has been the unofficial symbol of Norfolk since the local government began its “Mermaids on Parade” campaign in 2000. The campaign distributed 130 large bronze-cast mermaids to local artists for decoration and then placed them around the city for public display. The Norfolk mermaids became a cultural export when the Norfolk Sister City Association first had the idea to gift an original Norfolk mermaid to Sister City Kitakyushu, Japan in 2004. 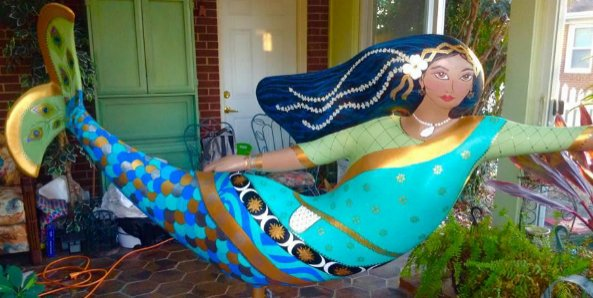 Since 2004, the Norfolk Sister City Association has commissioned four additional mermaids for her other Sister Cities, the most recent of which is the 2018 Kochi mermaid crafted by local artist, Patricia Barnette, and her daughter Robin Dunbar. The unveiling of the mermaid in June 2018 became an opportunity for Norfolk residents to learn about their Sister City of Kochi. During the three-week exhibition of the mermaid at the Slover Library, Robin Dunbar hosted an event where she explained the symbolism behind the mermaid’s design. Attendees learned about their Sister City as they watched a film about Kochi projected on the back wall of the exhibition space. Robin and Patricia worked as a team designing and painting the mermaid. Robin’s contributions to the design process helped create a mermaid deeply unique to Kochi. Maritime Identity of Norfolk and Kochi – The predominant color of the mermaid is blue, which evokes both cities’ maritime identity. Kochi also claims the color blue to provide a unique identity to their city. The mermaid’s sari has blue currents and waves; and the stars, the sun, and the moon that also adorn her sari represent the navigation of the seas that tie both cities to the rest of the world. Verdant Environment – The city seal of Norfolk (“Et terra et more divitiae tuae”) reminds us that both the land and the sea are the cities’ wealth. The green tones of the mermaid’s sari represent the natural gifts of the land environment that the cities strive to protect. Desire for Peace – Dogwood flowers, the state flowers of Virginia, and garlands of jasmine adorn the mermaid’s hair. Their white color represents the cities’ goal of fostering peace. Tradition – The gold band that crowns the mermaid’s head reminds viewers that Kochi is known as the Queen of the Arabian Sea. 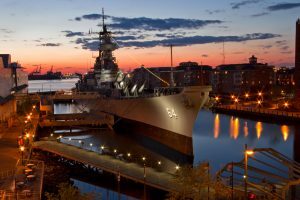 It also recognizes Norfolk’s tidal estuary, the Elizabeth River, which is named after Princess Elizabeth, a symbol of Norfolk’s past. Sisterhood – The entwined golden bracelet that interlocks symbolizes the bond between Kochi and Norfolk. The two nations, India and U.S. – The mermaid’s tail is adorned with peacock feathers, India’s national bird. The mermaid’s eagle feather bracelet represents the American national symbol and also celebrates the eagle’s recent return to Norfolk. The Spice Trade – The mermaid wears a golden rope with a bejeweled pouch representing the spice trade that brought prosperity to Kochi and put the city on the world map. Aquaculture – The mermaid is wearing a pearl necklace with an oyster shell pendant symbolizing the bounty of our waters. The Kochi mermaid serves as a commemoration of all of the qualities the two cities share as well as their relationship as Sister Cities. Since Kochi and Norfolk became Sister Cities in 2010 the two have shared in-bound and out-bound delegations, participated in student exchanges, and most recently participated in an effort to create a virtual exchange between a middle school in Kochi and the Academy for International Studies at Rosemont. This thoughtful cultural exchange between Sister Cities is an inspiration to everyone who wants to strengthen ties between distant populations through art. The depth contained in the cultures of our cities is an important tool in creating understanding between cultures and creating a more peaceful world. Norfolk plans on sending the mermaid overseas to Kochi in late September. No Replies to "Norfolk Sister City Association Sends a Mermaid to Kochi"